A short introduction to the start of day reminder and how it can help you. One major issue with time tracking is to remember to start, stop and switch tracking. To help, we introduced reminders. So Timeular reminds you to start, stop or alter tracking in these situations. What does the reminder do? We know that remembering to start tracking your time in the morning can be tricky , so the start of day reminder gives you a heads-up when you start your day. You will receive a notification (if you have not yet started tracking) like shown here and can start your tracking with a single click. How can the reminder be enabled? 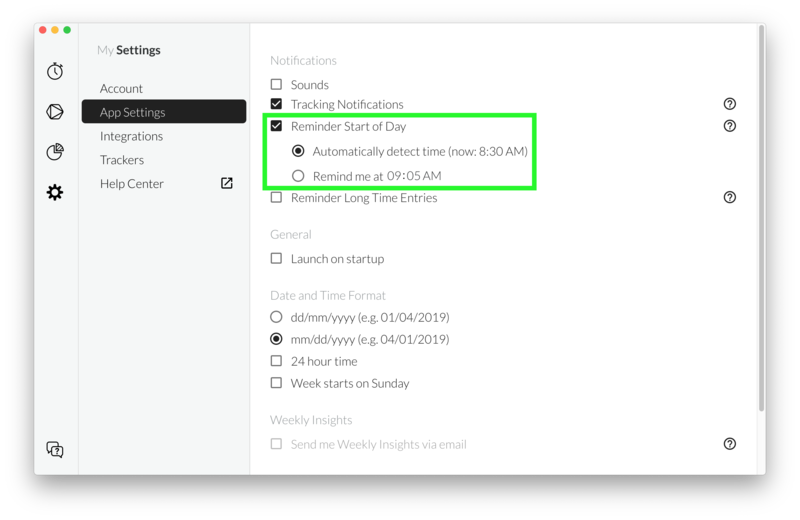 To enable this reminder, simply activate the checkbox "Reminder Start of Day" in the desktop application settings as shown below. Manually enter a start time in the morning. Timeular will remind you at this fixed time every weekday. If you choose 08:30, for instance, you will receive a reminder at 08:30 every workday (if your computer is turned on and you have not yet started tracking). Let Timeular automatically detect a good time for the reminder based on your tracked data. It will therefore look at your tracking data for the past month and find a good time to remind you to start tracking. The value for the start time is recalculated and improved every day to make sure we find the best start time for you. You can see the current value of this estimation in brackets (after now). If you need help, don't hesitate to contact us via [email protected] or through the chat box on the bottom right of this page.